I didn’t really think it was mine; I was being polite. I always order a tall coffee in a grande cup so I have room to add milk. The barista set my side of steamed 2% milk on the counter at the same time she put his tall coffee down. That’s why I asked. Just in case. It’s an embarrassing thing to touch someone else’s coffee cup. What’s the etiquette? I’ve seen people ask for a new cup of coffee, perhaps thinking of all the germy diseases that transferred from that two-second touch. I’ve seen people walk away without a second thought. Do you, the toucher, ask the touched if they want you to buy them a new cup of coffee? Touching a for-here mug, however, is that whole salad bar sneeze guard thing, except that there’s no sneeze guard at a coffee shop. Fortunately, I don’t need to worry about etiquette. Not today. “I got a Veranda.” He stares at me. This conversation has just turned awkward. “It’s the blonde roast,” I explain. That’s how the Starbucks baristas refer to it. There’s dark, medium and light roast. Blonde is the lightest; Pike Place is the standard medium roast; and there’s a rotating variety of dark roast. Knowing to say “blonde roast” means you’re hip with the proper terms and slang to fit in. You know how to order a drink. You’re a regular. I’m a regular, but I still refer to the coffee by the BEAN/BLEND itself, mostly because the dark roast rotates. The average blue collar drinker uses the roast terms. Will this guy understand me? “I’ve never had that,” he says as he pours excess, filled-to-the brim coffee into the trash bag. Ew. This is why, I get a grande cup. Would you pour hot liquid into your trash bag at home? “Oh, yeah, yeah,” he interrupts me. I’m a bit put out. He wanted to experience something new with his hazelnut. I want to share with him something I like that could turn into a new experience for him. He looks down at his coffee, stirring. I look over his shoulders at the signage board. It’s a place for my eyes to rest on before stirring more milk into my coffee. “I got a friend who’s a coffee specialty guy. He comes for the special coffee,” the guy says. Special coffee? What’s that? I’d like to try it if there’s something unique. “Does he come here to this store?” I ask. “Oh, he must get the Reserve coffee,” I say, pointing to the signage board I was just staring at. Good move there. 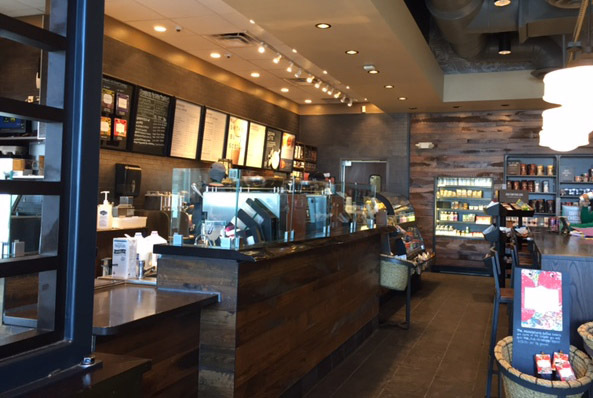 This store is a Clover location, which is one that has a special coffee machine. A Clover coffee was the first cup of coffee I had today, but you can only get a free refill with one of the regular coffees. It’s that act of wiping the coffee that catches my eye and stops me. He’s cleaning up his mess, like he would do at home. And he’s really cleaning it up, wiping hard with the napkin and scrubbing the counter space. ‘Just coffee guys’ don’t do that. Heck, coffee connoisseurs don’t do that. I do it when I can because there’s nothing more icky than setting your cup down on a sticky counter. Even when I put a napkin down first, I hope that sticky drop under my napkin is honey. He says something else, but it’s that friendly garble-rush of someone finishing a conversation with no room to continue. I don’t hear what it is because I stare at his clean counter area. I was wrong about him? He takes a seat at the window seat behind me. So, he wasn’t rushing to get out to his car after all. For some reason, him sitting there surprises me. Regardless, our moment is over. I’ve spilled some Splenda on the counter. I’d wipe it and brush it into the trash bag, but there’s a rim around the trash bag that I can’t get over. I brush the white powder on the floor instead. It’s something. Coffee drinkers are fascinating to me. I never knew there were so many different flavors. You nailed your encounter. Fun story, Diana. I’m glad coffee guy redeemed himself. I was worried about him.